As a Futuristic Modular Solution provider, Metrika is your partner for Customise Kitchens Designs and solutions, helping transform your home into spaces of comfort, elegance and efficiency. With the industry expanding, Metrika recognizes the need to develop and strengthen relations with all partners in order to deliver products specially designed to meet the demanding Indian consumer needs and taste for Modular Kitchens, Modular Beds & Modular Wardrobes. The Brand has its head office situated in Mumbai with it's experience center located in Mumbai, Ahmedabad and Pune. The recently opened Pune and Ahmedabad lifestyle stores are a tribute to the international quality products which Metrika takes the pride. 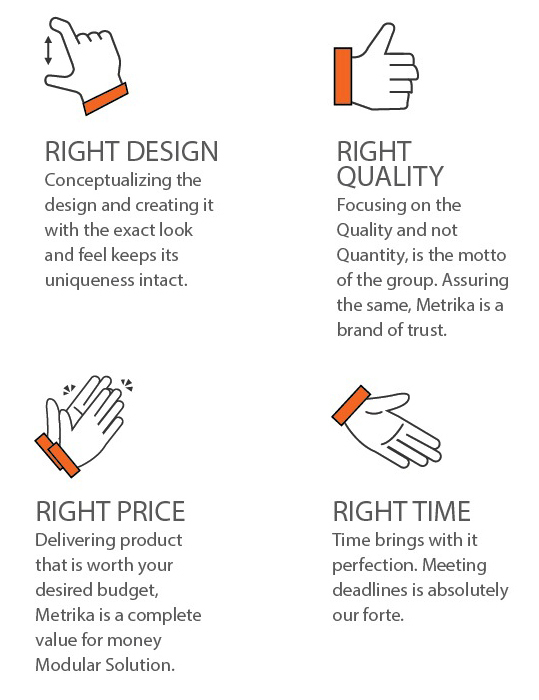 Inherent expertise of Metrika's in understanding the requirements of its customer & providing best kitchen solutions to them. To put it down simply, we don't offer what we make, we offer what the customer wants.